Friday night over dinner Valentine and I were trying to come up with a plan. With two days of clear weather forecast we really had to come up with something interesting. 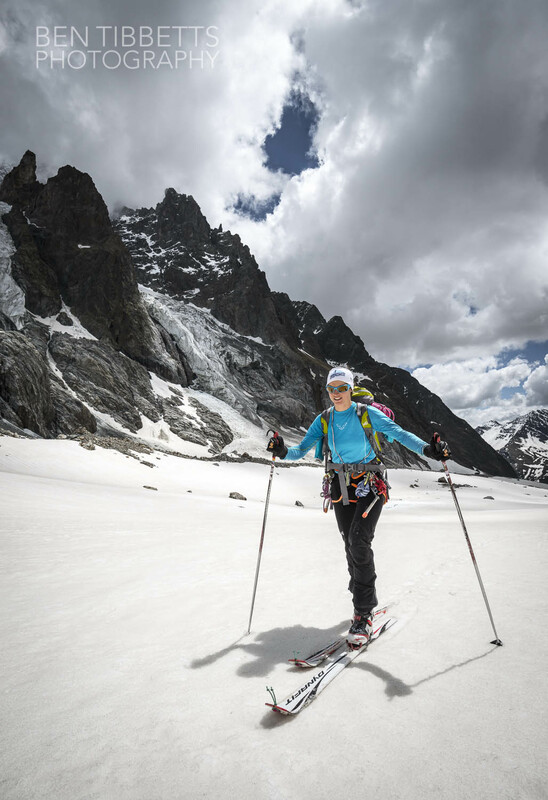 It had snowed considerably for much of the previous week, but with light winds this suggested that a route with a ski descent would be good, despite it being the beginning of June. 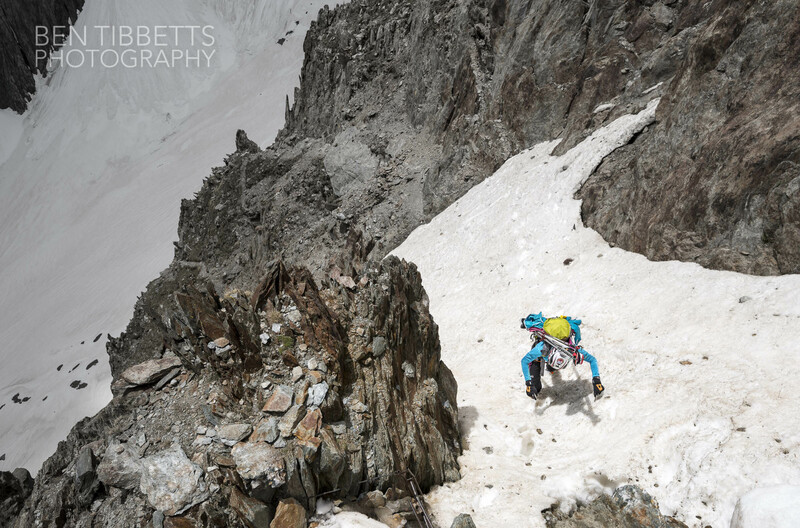 Hunting through Batoux’s ‘Mont Blanc 100 Finest Routes’ I stumbled over this route on the Italian side of Mont Blanc. I hadn’t even heard of, let alone knew anyone who had done it. With and 7 hour approach via a remote Bivouac refuge (Quintino Sella) it was far from a Chamonix style climb. However the route sounded very amenable, and a further 1500m climbing from the Bivouac hut would lead us within 100m of the summit of Mont Blanc and thus a descent down the cold north face snows back to the Plan d’Aiguille. As the Tournette spur faces SW and catches the afternoon sun I hoped all the new snow would also be well consolidated on the route. We left as soon as we could in the morning, headed through the tunnel and drove up to the very end of Val Veni. When I got everything into my bag, including a large camera I was slightly disgruntled by its volume. We had the great fortune however to meet the guardian of a nearby refuge who had driven up to the road-head where he had left another vehicle parked, his 4×4. He had the key to the barrier but also wanted to get both cars several kilometres further up the track… and so we drove his 4×4 all the way to the end of the track whilst he drove his town car, saving us nearly and hours walk! From here we walked along the west moraine of the Glacier du Miage for a bit until we met the snow and put skis on at about 2200m. 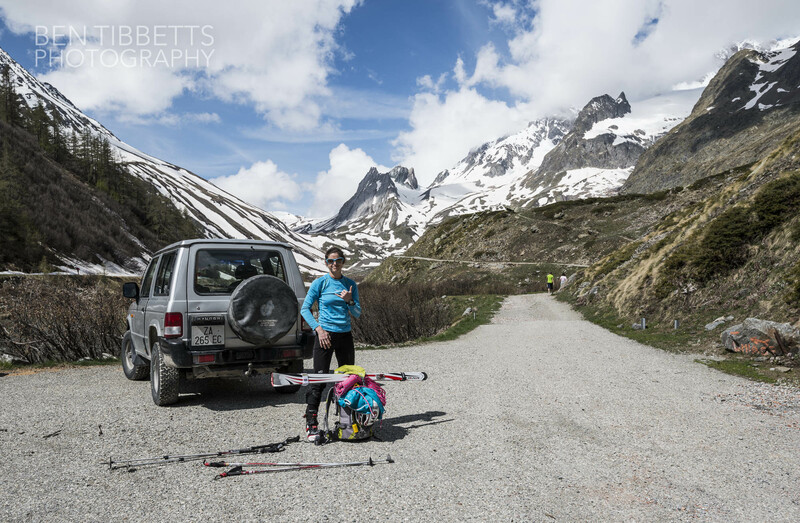 This side of the Mont Blanc massif has a rather different scale and feeling to the more domesticated Chamonix side. 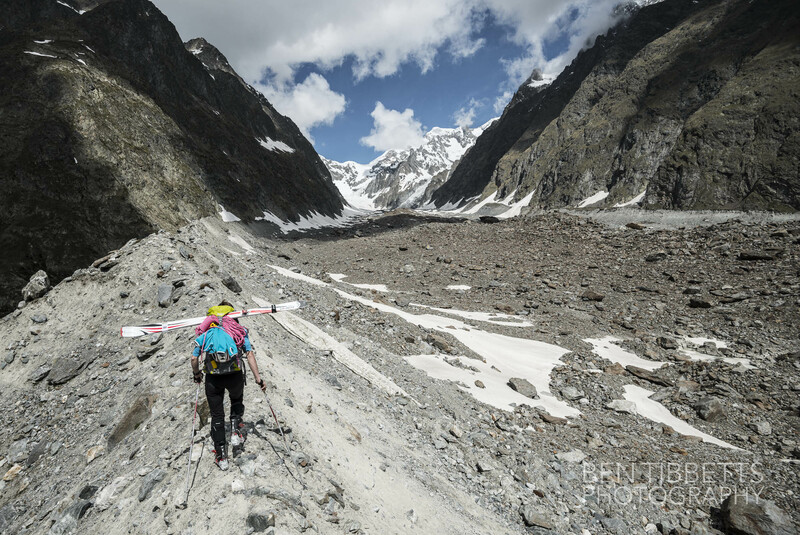 Walking up the moraine of the Glacier du Miage… destination in the far distance! From here it was steady going until we reached the base of the Glacier du Mont Blanc, and the ridge leading up to the bivouac hut. Unfortunately the glacial recession at the snout of the Glacier du Mont Blanc is such that the old direct route to the Quintino Sella now seems unreasonable. After some deliberation we decided to continue the approach by a much longer route, via the Gonella refuge. 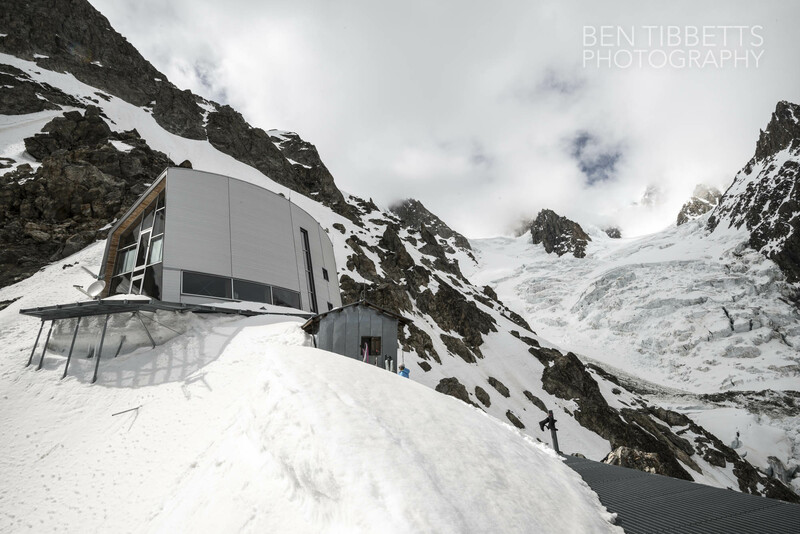 At this time of year there is still a lot of snow lying in the gulleys and slopes approaching the hut. By the early afternoon these had warmed considerably and the at times exposed traverse up to the hut was fairly arduous with skis on and off. Lots of scrambling on the approach with insitu ropes and chains. After quite a slog we arrived in the early afternoon. 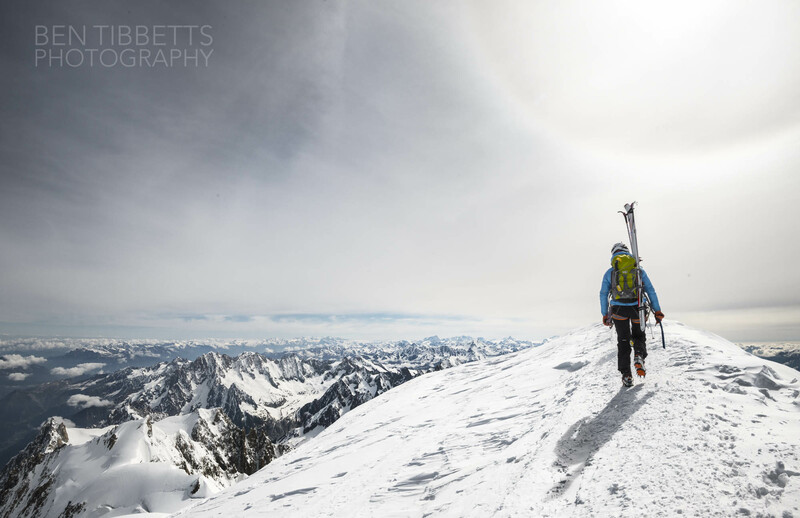 We realised that approaching the Sella Bivi was now out of the question as it was up a long 45º west facing couloir that was in full sun. We settled into the rudimentary Gonella winter room and tried to dry out our gear. 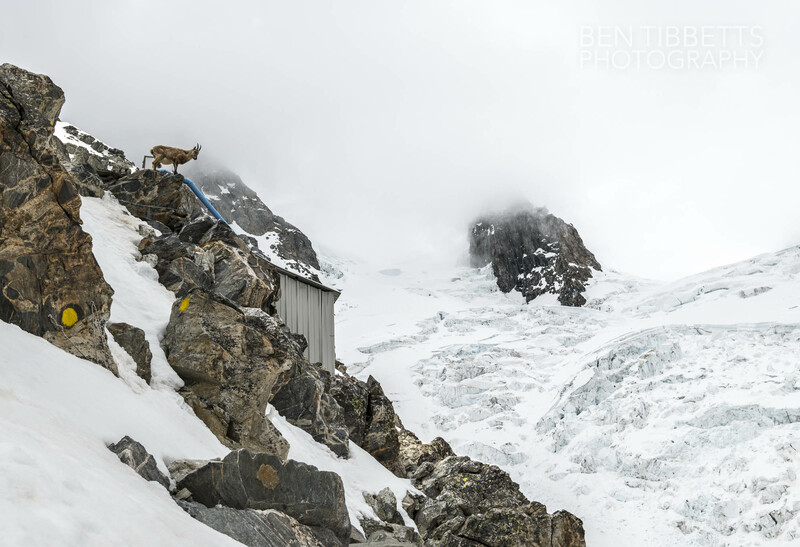 Despite being at over 3000m there were bouquetin about… not sure what they eat up here as the grass cover where the snow had melted looked minimal! Gonella summer refuge, plus winter room to the right. 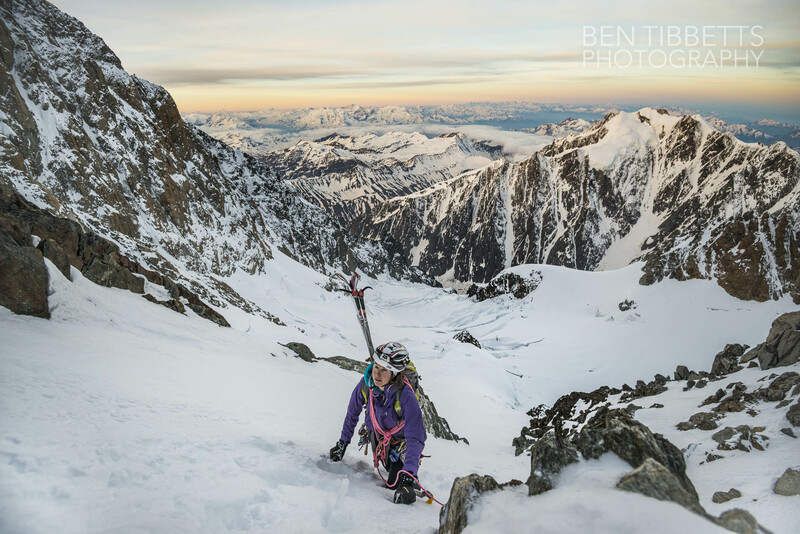 We got up at about midnight as from the Gonella, after descending a bit to start, we had 2000m climbing to the summit of Mont Blanc. 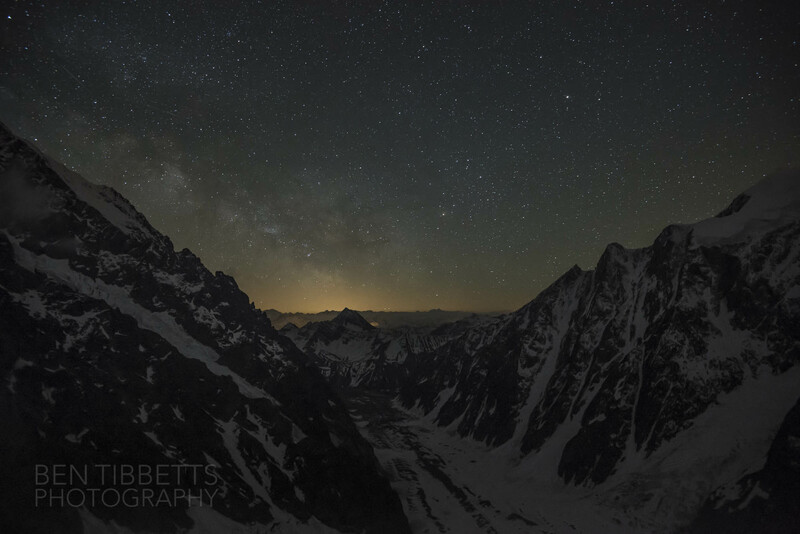 View at midnight from the Gonella down over the Miage Glacier. Crossing the Glacier du Dôme to get onto the couloir leading up to the Sella was less than amusing and involved several dead ends and some crawling on all fours over delicate crevasse bridges. 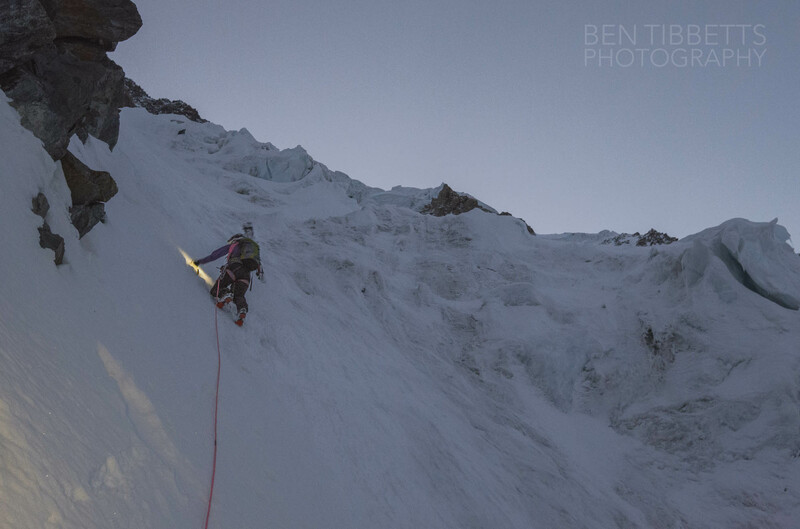 The couloir was well refrozen and an amenable 45º for about 600m. Nevertheless in the dark we took a wrong branch and ended up at a dead end having to traverse a ridge and some mixed ground to re-find the route. 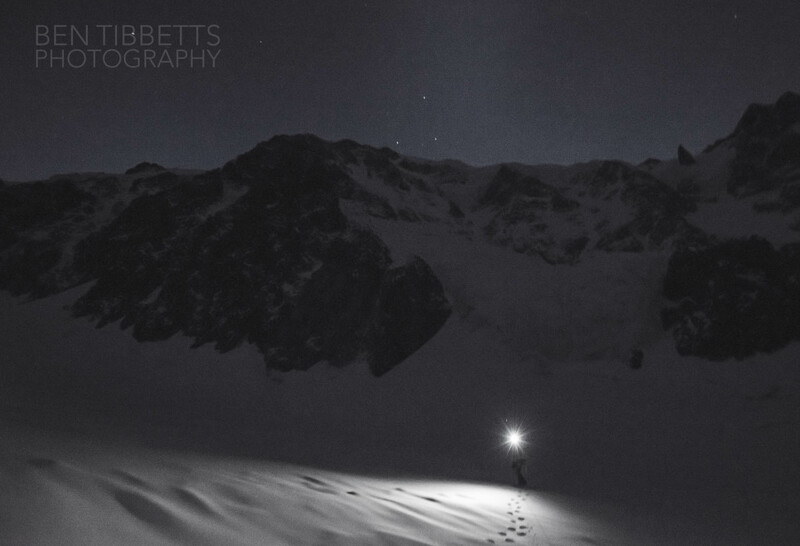 A view of the Tournette Spur in the dark from the upper Glacier du Mont Blanc. The route follows the edge of the snow/serac slopes and rocky spur leading up from right to left. Pausing a hundred metres past the rimaye. Valentine leading off up the snow slopes. We are just out of the fall line of the seracs the cover most of the face. The rimaye had passed easily at about 3700m. I had felt pretty good despite the cold breeze and relentless drudgery through the long dark hours. At about 4100m however the altitude started hitting me hard. We had taken the rope off by this point as there was no protection to attach to. For the previous 1200m of climbing we had been alternating a couple of hundred metres of breaking the trail each. From here on though we both slowed down significantly, and little by little the alternation was reduced to 50 steps each, then 40, 20 until around 4300 I was cooked. High up on the face and the fatigue is setting in. Valentine took over breaking trail for the rest of the route and we crept up little by little. The snow was well consolidated and if we were well acclimatised we could race up this. As is suggested in these conditions it made more sense to climb the snow and ice to the side, rather than the spur itself. Valentine punched steps up the slopes and couloirs and I tried to keep pace. It soon got to the stage that every 30 steps I crouched over my axes and breathed deeply for a minute. My mind was spinning and vacant, but it was quite clear that getting out the top of the route was going to be easier than reversing the 2400m back down. For the last few hours I had also been struggling to keep my feet warm by shaking and swinging them at each respite. By 4450m I was managing only 10 steps before resting. Through the brain fog I felt slightly disappointed with myself for getting in this situation. 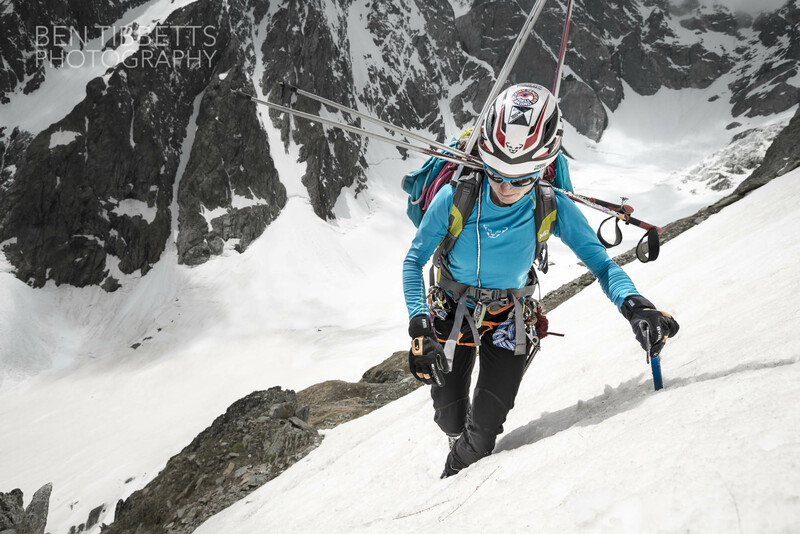 The route was simple and I had thought I was still better acclimatised than was the case. My feet hurt. I hoped this was a good thing. No pain would suggest they were stone cold. The suffer-fest carried on for several more hours, much longer than we had planned. But eventually we burst out into sunshine and directly onto the Arete des Bosses, just 20mins from the summit. Cirrus cloud was already obscuring the sun slightly at 9:30am and forming a 22º sun halo. 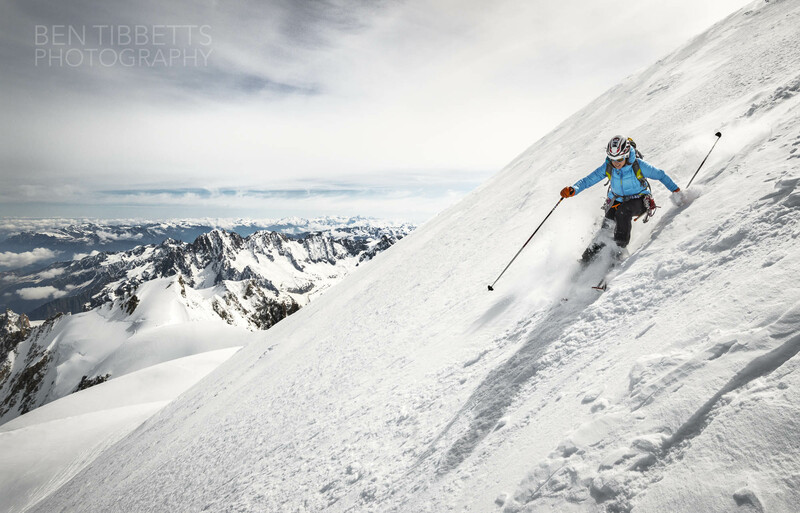 Valentine skiing great powder on the Mont Blanc north face. The skiing down was great for much of the way in cold powder, then lower down we found re-frozen crust and all other horrors! My feet started to defrost before we got back to the Plan de l’Aiguille and I was in abject agony. De-frosting from frostbite, as it turned out to be (stage 2… no permanent damage), makes normal hot aches seem like childs-play. Not to be repeated. I find altitude curiously unpredictable. 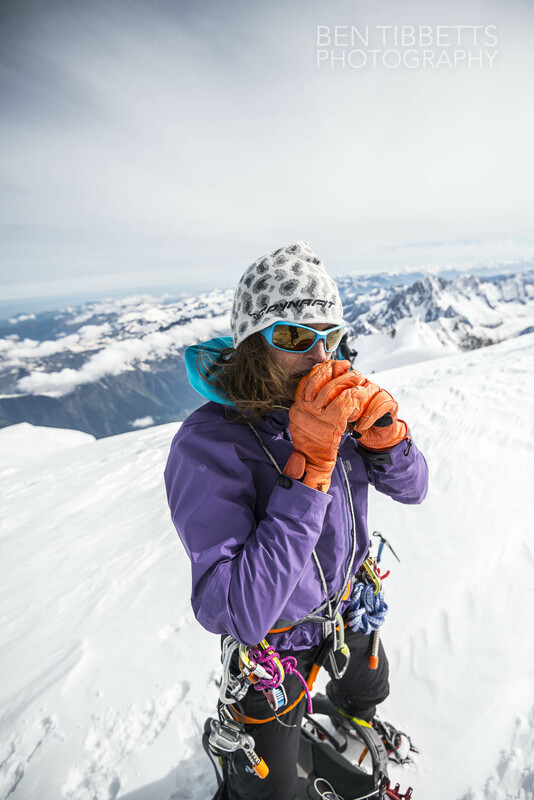 I have done routes up Mont Blanc with little or no acclimatisation before without problem, and another time have even developed symptoms below 3000m. A fickle mistress it seems. 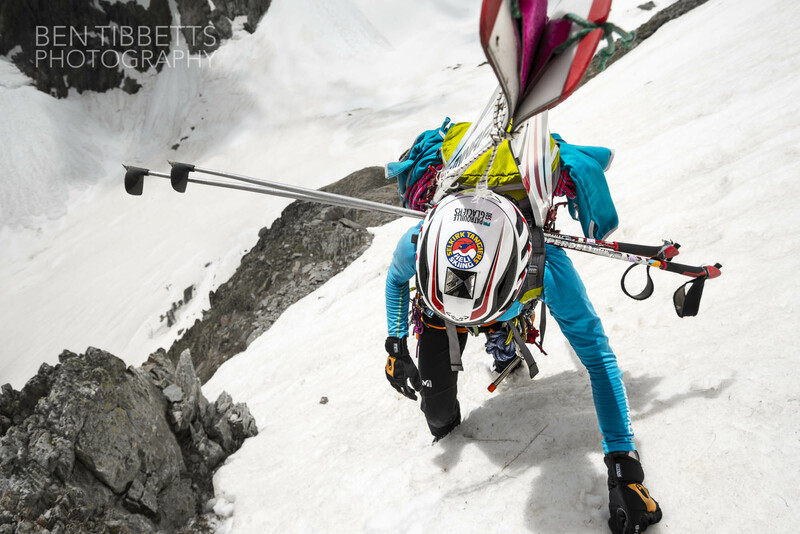 Great write up Ben – sounds like a really interesting route. Photos are alright too…. Very glad your toes are going to bounce back. 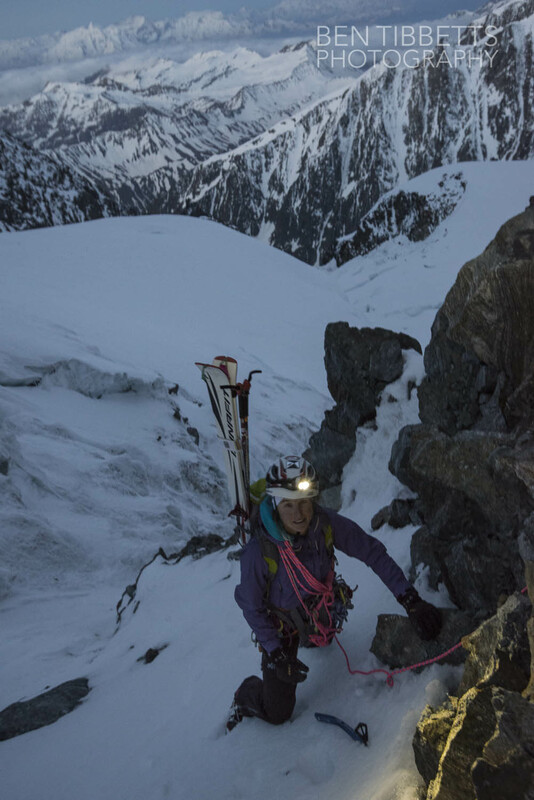 Impressive route-finding from Gonella in the darkness. 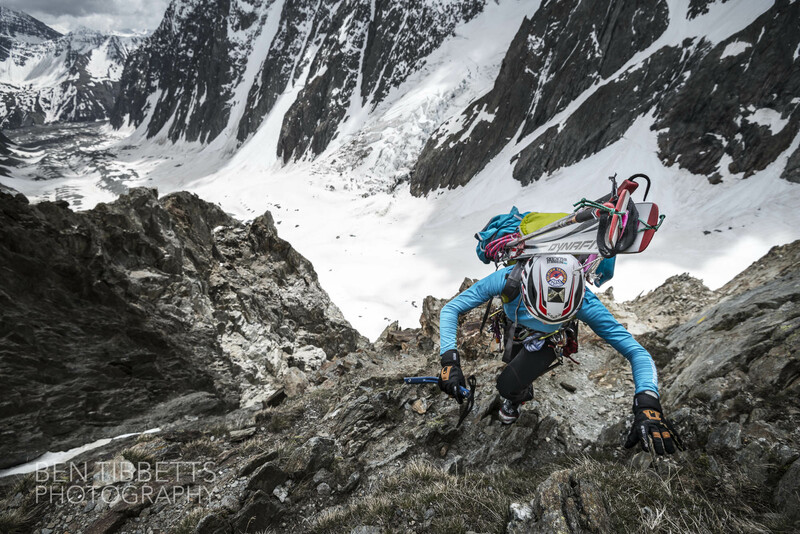 Will the route to Q Sella hut be doable in the beginng i\of July? 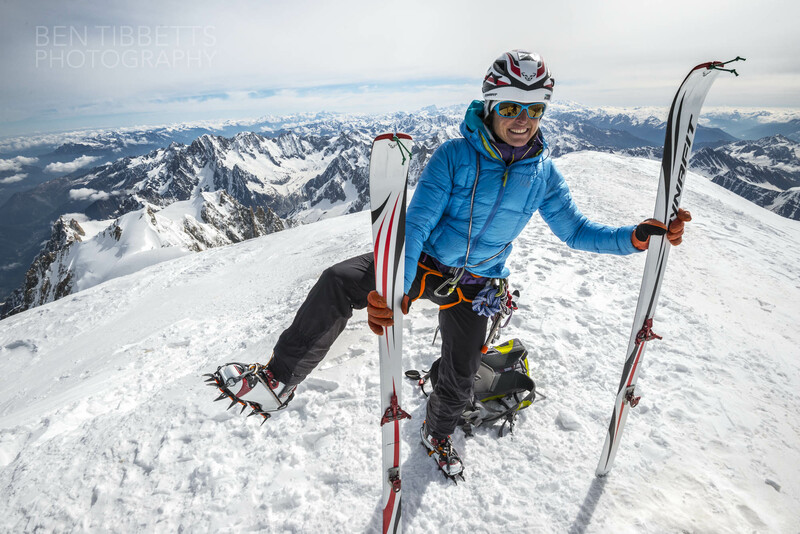 Will skiing the North Face of Mont Blanc be possile in July? Ben, I’m pleased you’re doing so well in the direction you always wanted to go! You are an inspiration to the old boys who did not have your gumption and determination in life! You were always a dark horse – so full of surprises! Good luck always! Good to know it is not just me hit by unpredictable altitude effects (and advanced age effects as well in my case, but certainly not yours).